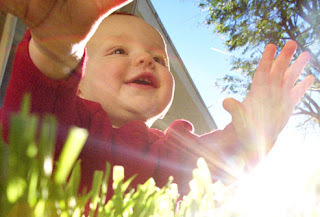 Happy Babies: It's been fun summer... but who's ready for FALL!? It's been fun summer... but who's ready for FALL!? Summer has been SO much fun! My family and I have had some wonderful experiences. 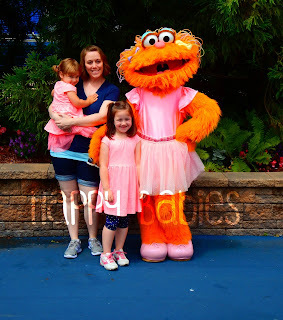 We kicked off the summer with a road trip out to Pennsylvania in June where we got to visit Hershey's Chocolate World, Hershey Park, and Sesame Place! 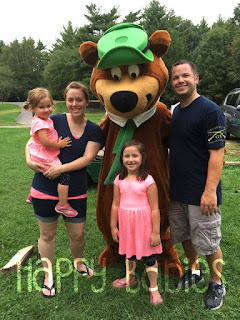 Then we closed out our summer with a fun camping trip to Yogi Bear's Jellystone Campground in Wisconsin Dells in August. ....just realized my girls and I are wearing pretty much the same outfits in both pictures HA! I hope that all of our Happy Families have had a fabulous summer spending time together and exploring new things and experiences! I love summer, I do. But even more than that, I love LOVE fall! The weather, the colors, the food, the activities, all of it! I am so ready! 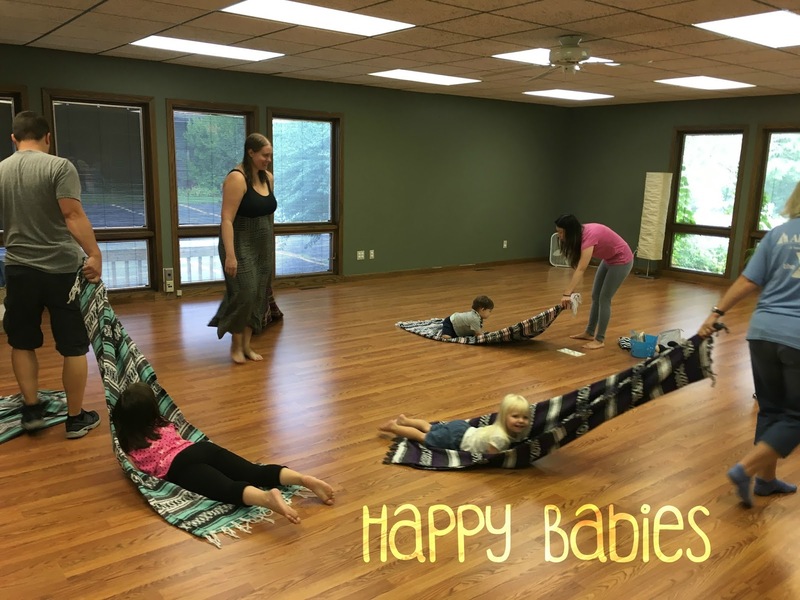 I am also ready to get back into routine and start up Happy Babies classes again! I got to see a few of you during our mini session over the summer, but I can't wait to see the rest of my Happy Babies & Tots and how much they have grown over the last few months! Exploring icy cold water during Discovering Cold week in Happy Tots class. Sliding on our tummies like penguins in Happy Tots class! Working on fun farm themed projects during a Happy Families class. 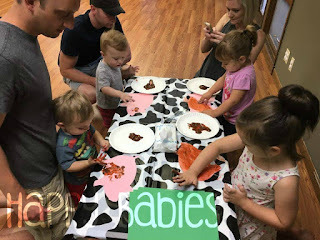 A peek inside some of the art projects we worked on during the Happy 3's trial class. 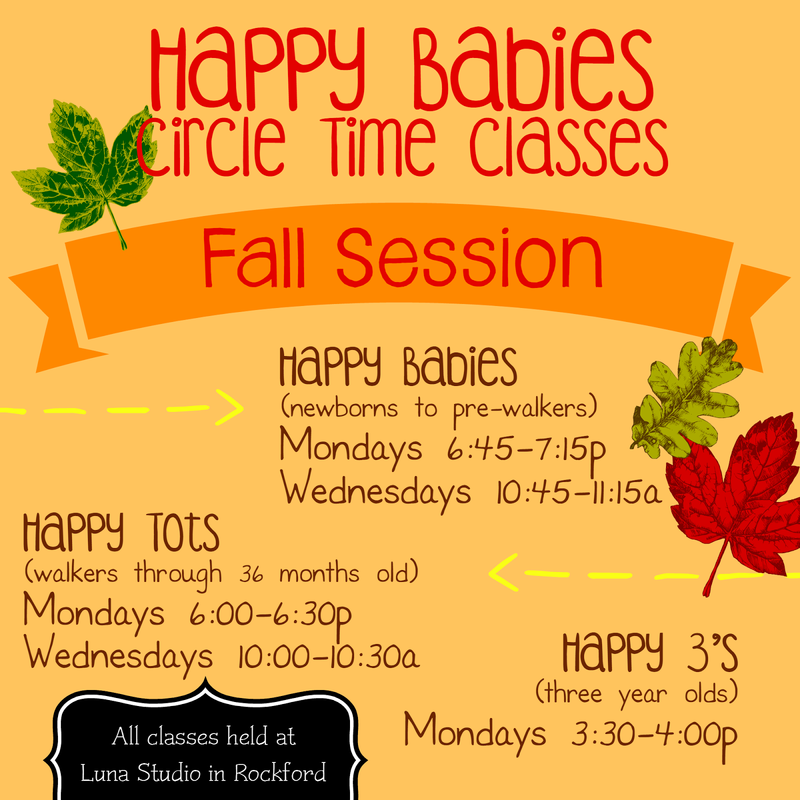 Our Fall Session will begin on September 26th and go for 10 weeks, with no class on October 31st for Halloween festivities or during the week of November 21st for Thanksgiving. Classes will be Monday afternoon/evenings and Wednesday mornings at Luna Studio in Rockford. 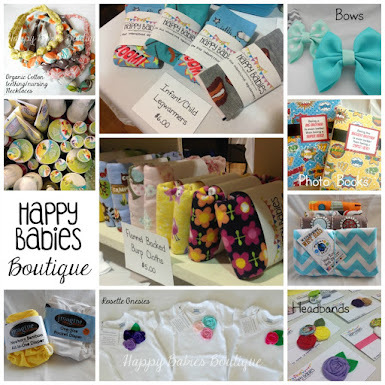 Dates for Happy Families classes will be announced soon, and will be one Saturday per month. Registration for the Fall Session is open now! 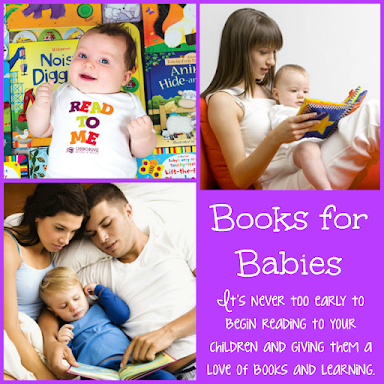 Class descriptions can be found on our about page. For more information and details about the Fall Session and to register CLICK HERE. 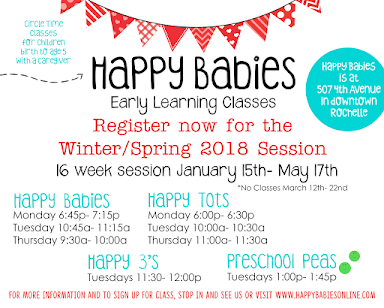 For those of you following along on my facebook page, you know I have been trying to bring Happy Babies classes to the Rochelle area. I am still trying but have not been able to secure a location just yet. Sorry for the delay, thank you all for waiting patiently! I am looking forward to a fabulous FALL with all of my Happy Families!